Montreal, July 26, 2018 - Racecar driver Alex Tagliani produced two fine performances on Wednesday evening's twin bill feature races - rounds 5 and 6 of the NASCAR Pinty's Series - held on the 0.546-kilometre Wyant Group Raceway short oval track in Saskatoon. The 22 Racing driver collected his second consecutive podium finish, coming home in third place in the first 125 laps feature race, and then crossing the finish line in sixth place in the second race after a close call with two backmarkers late in the race. "This was a great evening of racing; our car was very fast. 22 Racing fixed the oval car problems we encountered in Autodrome Chaudière and everything was fine," said Alex Tagliani. "In the first of the two feature races, we had a car to win, but it was even better in the second 125-lap race. "The podium finish of the first feature gave us a pretty good idea how good the car was performing. In the second race, I was right behind cars #2 (Cole Powell) and #24(Donald Theetge) while they were fighting for second place. I stayed behind to save my tires. Unfortunately, two back markers collided in front of my Chevrolet Camaro ZL1 EpiPen/RONA/St Hubert and I brushed the wall, losing momentum and a couple of spots. I regained my rhythm, but this is not a track where it's easy to pass. Near the end of the race, I was fighting for fifth place with D. J. Kennington, but he kept the high line until the end, preventing me from passing. I am proud of the work the crew at 22 Racing did, because we had an excellent car. Things are looking great for Edmonton. If we can pick up maximum points there, the last stretch of the season, with five races remaining, will be very exciting." Starting from the inside of row 4 for the Velocity Prairie Thunder Twin 125s, Tagliani stayed within the top seven for the first 90 laps, before easing up to fifth place. The Quebec-born driver moved into high gear for the last 35 laps and drove his EpiPen/RONA/St Hubert Chevrolet Camaro ZL1 to third place behind runner-up Cole Powell and first-time series race winner Donald Theetge, his 22 Racing teammate. Marc-Antoine Camirand, Tagliani's other 22 Racing teammate, finished fourth. Eighteen drivers started the first race with 16 crossing the finish line. Nine cars finished on the lead lap. The second race was once under full course caution for a total of seven laps. In the second feature race of the evening, Tagliani kept up with the top five drivers after starting sixth on the grid. While running fourth on lap 85, he tangled with two backmarkers - Brett Taylor and Jason White - who were in a fight of their own. Tagliani lost his momentum and a couple of places on the leaderboard. He finally crossed the finish line in sixth place behind D. J. Kennington. Cole Powell scored his first series win ahead of L.P. Dumoulin and Marc-Antoine Camirand. Eighteen drivers made it to the starting line for the second race with 17 crossing the finish line. Ten cars finished on the lead lap. The first race was under full course caution once for a total of 8 laps. The Velocity Prairie Thunder Twin 125s will air on TSN on Saturday, August 4 at 1:30 p.m. ET. 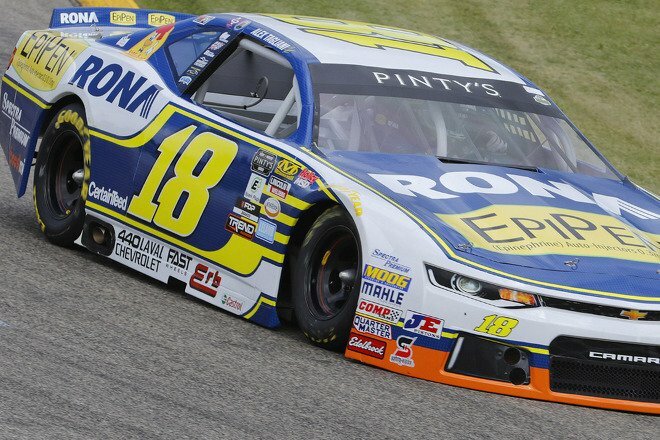 In the point's chase, Tagliani stays in sixth place with 228 points, only 14 back from new points leader Cole Powell. In 64 NASCAR Pinty's Series starts, Tagliani has six wins, nine poles, 25 top-fives and 42 top-ten finishes. Up next in three days: Edmonton, Alberta for the LUXXOR 300 on Saturday evening, July 28 at the Edmonton International Raceway. The green flag will be waved at 7:30 p.m., Mountain Time.